The agave (aloe Vera) is an adaptable plant that is easily found on many windowsills. Long fleshy leaves of the plant is a storehouse of vitamins and minerals. The plant is a natural healer and part-time – the great beautician. Like any other plant, aloe Vera needs a transplant. How to do it right? Do not rush to transplant a new plant. Better postpone the event until spring. Moreover, in any case necessary to withstand a two-week quarantine. For replanting, choose a pot larger than the old diameter. The day before the transplant, water the plant. Next, start to fill the prepared pot:1. On the bottom pour the drainage, consisting of expanded clay or broken bricks. Aloe does not like high humidity and a drainage layer is necessary for rapid drainage.2. Next, prepare or purchase ready-made substrate. The substrate is made from turf, leaf soil, humus, sand and charcoal.3. Pour a small layer of substrate on the drainage. Remove the plant from the old pot, turning it. Gently clean off the ground with the root ball.Place the aloe into the pot, making sure that the root collar of the plant was a couple of inches below the rim of the container. Pour the roots of the agave substrate, passing a little tamping the soil. Pricenice aloe and do not water until the rooting (4-5 days). Aloe needs moderate watering. Too high soil moisture causes root rot of plants. Aloe under five years of age need annual spring replanting. Plants older than five years need a transplant every 2 years. There are many varieties of aloe. They hit their leaves, thorns, size or color. And yet, the most usual form of aloe to our apartments is the aloe tree. Aloe, which is rightfully called the green doctor. Juice it is used for the treatment of rhinitis, purulent diseases, to enhance immunity and as a cosmetic. But aloe tree is very rarely sold in stores and the easiest way to start a home prickly doctor – layering. Cut the cuttings from adult plants of aloe. Try to cut the stalk had at least three pairs of leaves. The plant, which cuts the stalk must be strong and healthy. With weakened plants-nurseries and the cuttings are weakened. Dry stalk within a few days. Take your time. Cuttings aloe can root even after three weeks drying. 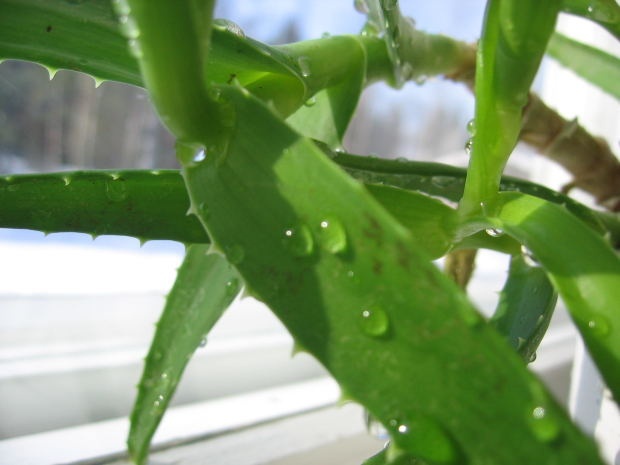 Aloe – a succulent, so water it often rots than rooted. Do not take chances. Korenaga aloe as well as all of the succulents in the ground. Mix soil for cacti with washed sand in proportion 1:1. On the bottom of the pot, place a layer of expanded clay or gravel, for drainage. If you are accustomed to water their plants every day, make sure you have good drainage and make sure the drainage holes in the pot were not clogged. This will keep your aloe from the Gulf, until you get used to the special watering for succulents. Plant the cutting into soil, do not bury too deeply, it is sufficient if the lower pair of leaves will barely touch the surface of the soil. If the shaft is unstable, pour a layer of gravel on top of the soil. Carefully pour and put in a bright warm place. 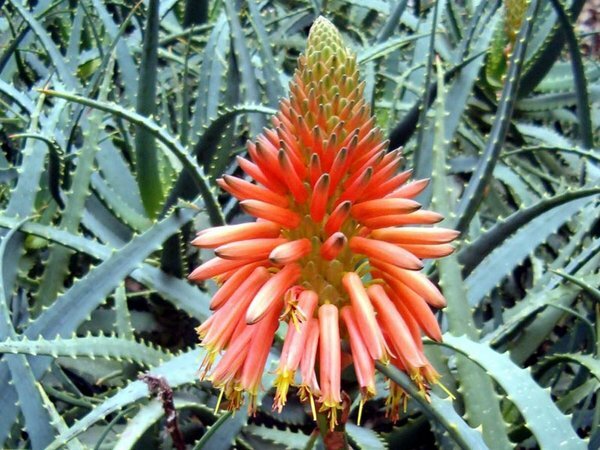 Aloe – child of the desert, so it does not need high humidity while rooting. It is not necessary to place the pot of rooting cuttings of aloe in a propagation case. But he needs a lot of sun, and preferably bright. Rooting of cutting may take two to four weeks. It is very important during this period to comply with the watering. It's better to be less water than more. It is a plant adapted to prolonged periods of drought, but waterlogging is almost not stand. Aloe deeper root, if you water it only after complete drying, carefully follow this. That your baby is rooted, you will understand, seeing a new leaf peeking out from the outlet. If you had to the stability of the cutting pour a layer of gravel on top of soil, keep in mind that the gravel slows down evaporation. In this case, to water rooting cuttings aloe is even less, about 1 every two weeks.